The UK's top selling album group of the 21st century, Westlife, finally re-form after 6 years. Shane, Nicky, Mark and Kian announced their return to music in October 2018 to a frenzy of media coverage and social media activity. Their brand new tour, 'The Twenty Tour' kicking off this May is Westlife's fastest selling tour of all time. The band sold an incredible 400,000 tickets in just 48 hours. The shows will see the global pop kings perform brand new songs, alongside their greatest hits and all 14 of their UK No.1 hits including as 'Swear It Again', ‘Flying Without Wings', ‘You Raise Me Up’ and 'Unbreakable'. 📍 As a Live Nation member, you can use the below promo code to pre-purchase tickets at tixCraft from 11AM to 5PM on Apr.13th, maximum 4 tickets per code. Up to 4 tickets are allowed per person. Tickets are limited for presale session. Please note there is no guarantee that you can get tickets or better seats during presale. tixCraft Ticketing and Live Nation Taiwan Website are different websites, in order to attend Live Nation Taiwan Members presale, please register on both sites. 📍 Everyone who purchases tickets will get commemorative paper tickets. You can choose to print a special name for memory on the commemorative paper ticket when you make a purchase online.This service is available no later than Apr. 20th 2019. -Please note the name is not editable after submission. -You can only enter names in Traditional Chinese or English. Chinese name should be shorter than 7 characters, and English name also should be shorter than 25 lower cases letters. The length of names in mixed characters will automatically be determined by System. -Please note one space is counted as one lower case letter and please DO NOT use any special characters in the name. 📍 Please notify on-site staff within 10 minutes after the show starts if you find any view blockage that is not stated in any official announcement. Once on-site staff confirm the view of the seat is blocked, on-site staff will change the seat for you subject to availability. It will be deemed to consent to the seat arrangement if there's no respond. Sections mentioned below are in partly view restricted areas. Please consider thoughtfully before purchasing tickets. Thank you. Seats in row 1-7 at "藍2C", “藍4C" are in partly view restricted area due to FOH and camera platforms. You may not be able to see some parts of Artists performance and LED screen on stage. There are safety railings in the front of first row on level A and B. The railings might block part of views from certain audiences. If you do mind the view restricted from safety railing, please choose other rows/ areas or seats. All consecutive odd/ even seat numbers in the same row in all area are adjacent seats to each other. There are some areas on level A with odd and even seat numbers together. If you choose "computer generated" when you purchase tickets and see computer choosing seats in a mix of odd and even seat numbers, these seats are adjacent to each other. The row numbers on level A starts from 0 and increase progressively which means Row 0 is the closest row to the stage, row 1 and after follows. 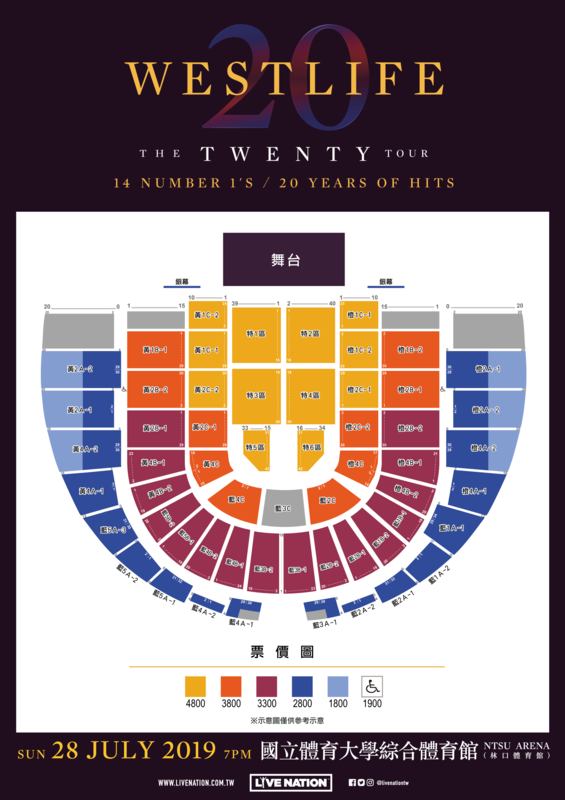 The row numbers on level B starts from 15 and decrease progressively which means Row 15 is the closest row to the stage, row 14 and before follows. The row numbers on level C starts from 1 and increase progressively which means Row 1 is the closest row to the stage, row 2 and after follows. No suitcase of any kind/ professional Video and Audio Recording Equipment / Professional Photo Cameras / Telephoto Lenses / Drones / Tablets / Go Pro Cameras are allowed. There will be security check while entry. Any items against Security regulations will not be allowed for Entry.Please arrive in advance for security check to avoid late entry. There will be no lockers in the venue, if you have any luggage or any prohibited items, please don't bring to the venue. For concert general guideline and security regulations, please go to Live Nation Taiwan website livenation.com.tw or follow Live Nation Taiwan Facebook page www.facebook.com/livenationtw/ . For Lost Seat Tickets: Dial 02-8772-9835 or EMAIL：tixcraft@tixcraft.comat your earliest convenience. Please bring police report, proof of purchase and you photo ID and go to the tixCraft ticket booth before 5:00PM on show day to sign the certification document. Once show starts and the seat is confirmed as not occupied, you will be able to enter. However, if anyone with the ticket shows up and he/she will be the priority, audience who lose tickets need to re-purchase ticket for admission. We may report to police station if there is controversy. Reissue of tickets is not available, please keep your tickets well. Please check Live Nation Taiwan Official Facebook Page for admission guidelines https://www.facebook.com/livenationtw/. The promoter reserves the right to alter / amend / modify or cancel the event without notice. After 2019/07/26, payment method is "Credit Card" only. VISA, MASTER, JCB and UnionPay cards are acceptable for credit card payment. American Express and Diners credit cards are not acceptable. All tickets will be delivered via appointed logistics company to your delivery address within Taiwan, Penghu, Kinmen and Matsu. Overseas shipping service is not available. Please choose "現場取票 (Event Venue Collection)" as your delivery method and collect your tickets at ticketing booth on site. Your membership information will be used as shipping information. Please make sure that your name, phone number and address are correct in order to receive tickets or products successfully. The tickets that are purchased before 2019/06/28 can be delivered to only one address per order. The tickets that are purchased from 2019/06/29 and after must be picked up at the venue. The service fee of "國內配送(Domestic Distribution)" and "現場取票 (Event Venue Collection)" ：A NT$100 service fee is applied per order. Please fill in "real, complete and accurate" recipient names and addresses in Chinese. Incomplete names, incomplete addresses, names in English or other languages, or nicknames may cause difficulties to the delivery process. When the mail is returned to tixCraft ticketing office, the order will automatically be converted to "現場取票 (Event Venue Collection)". If your delivery address is your office address, please make sure it could indeed deliver to you. (For example, please write down the company/department name and extension phone number explicitly). If the mail is lost due to internal delivery issue of the mailroom or incorrect address / contact information, tixCraft reserves the rights not to re-issue the tickets. In order to help consumers to receive the tickets in a fastest manner, and to avoid "theft & fraud", you need to fill in the correct delivery address before your submit the order. tixCraft will not allow any modification on the delivery addresses once the order is successfully made. Tickets will begin to be sent in batches from late June. tixCraft will announce on website and the system will send emails to the members who made the order. Please check your inbox for an email from us. If the tickets are not delivered within 5 working days after you received the notification email, please call 02-8772-9835 during office hours. If you choose "現場取票 (Event Venue Collection)" as your deliver method, please collect your tickets at our ticketing booth on site on the day of the show (Time will be announced separately). Please note you CAN NOT change "現場取票 (Event Venue Collection)" to any other delivery method once you have submitted. Upon picking up your tickets, you will be asked to show the following information for identity verification. Photo ID (ex: insurance card, passport or other forms of ID). Please note the name on the ID MUST BE THE SAME as the name registered in your membership. If the purchase date is 2019/04/19, then the deadline for the refund application is 2019/04/22. If the purchase date is 2019/04/20, then the deadline for the refund application is 2019/04/23. When apply for ticket refund, customers who paid by cash or ATM transfer will be refunded in cash, and those who paid by credit card will get the refund from the credit card used. If the tickets have not been picked up yet, please download and complete the ticket refund application form. Please have one copy of your passbook (valid domestic account in Taiwan only) and the completed application form faxed to 02-8772-9853. The copy of your passbook must show bank’s name and branch, account holder’s name and account number clearly.